Outlandish Observations: Book 8 update! Diana Gabaldon posted a description of WRITTEN IN MY OWN HEART'S BLOOD on her blog yesterday. It's intended for use as "catalog copy" for the publishers, and it's only a few paragraphs long, but it's very interesting! I don't consider it spoilerish -- it's the same level of detail that would be on the inside front flap of the hardcover -- but there were a couple of details that surprised me. 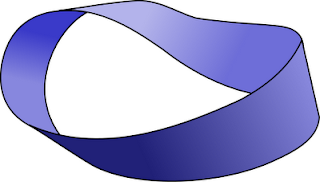 And if you're wondering about the reference to a "Moebius twist", here's an example of what a Moebius strip looks like. I'm guessing that reference has something to do with time-travel paradoxes? "I’m still _writing_ this. With luck, it will be published in fall of 2013." "I told my editor I want an octopus on the cover of this book. (There are eight main characters whose stories are told--and they’re all linked together.)" It's very exciting to see WRITTEN IN MY OWN HEART'S BLOOD starting to come together. I can't wait! The best video I've ever seen depicting the concept of the Mobius Strip is by Vihart http://youtu.be/4mdEsouIXGM.